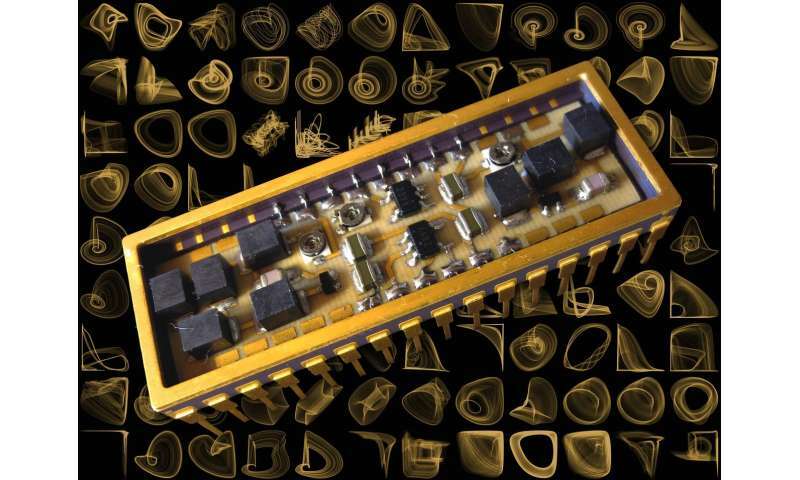 It's really surprising that many simple electronic circuits built of just a few components behave chaotically, in an extremely complicated, practically unpredictable manner. Physicists from the Institute of Nuclear Physics Polish Academy of Sciences in Cracow have discovered, examined and described dozens of new, unusual circuits of this type. What is especially interesting is that one of the circuits generates voltage pulses very similar to those produced by neurons, only it does so a thousand times faster. Just a few transistors, resistors, capacitors and induction coils are enough to build electronic circuits that behave in a virtually unpredictable way. Even in such simple systems, chaotic oscillations of a complex nature turn out to be the norm. In a paper published in the journal Chaos, the researchers present 49 new, unusual chaotic electronic oscillators—not purposefully designed, but discovered in computer simulations. "Electronics is usually associated with devices that work precisely and always according to expectations. Our research shows a completely different picture. Even in electronic circuits containing only one or two transistors, chaos is ubiquitous. The predictable reactions of common electronic devices do not reflect the nature of electronics but the efforts of designers," says the study's first author, Dr. Ludovico Minati (IFJ PAN). By chaos, we generally mean lack of order. In physics, this concept works a little differently. Circuits are said to behave chaotically when even very small changes in input parameters result in large changes in output. Since various types of fluctuations are a natural feature of the world, in practice, chaotic systems show an enormous variation of behaviour—so great that precise predictions are very difficult, and often impossible. The circuit can thus seem to be behaving quite randomly, even though its evolution follows a certain complicated pattern. Chaotic behavior is so complex that to this day, there are no methods to effectively design electronic circuits of this type. So the researchers approached the problem differently. 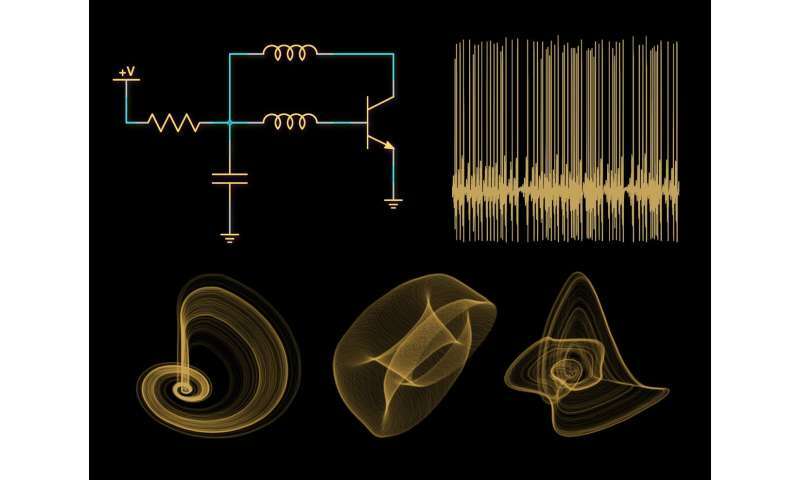 Instead of building chaotic oscillators from scratch, they decided to discover them. The structure of the circuits, made up of commercially available components, was mapped as a sequence of 85 bits. In the maximum configuration, the modeled circuits consisted of a power source, two transistors, a resistor and six capacitors or induction coils, connected in a circuit containing eight nodes. These strings of bits were then subjected to random modifications. The simulations were made on a Cray XD1 supercomputer. "Our search was blind, in a gigantic space offering 285 possible combinations. During the simulation, we analyzed more or less 2 million circuits, an extremely small area of the available space. Of these, about 2,500 circuits exhibited interesting behaviour," says Dr. Minati, and emphasizes that chaotic electronic oscillators were known about previously. Until now, however, it seemed that they occurred in only a few variants, and that their construction required some effort and an appropriately complex system. The researchers analyzed the behavior of the new circuits using the SPICE program, commonly used in the design of electronic circuits. However, in the case of chaotic behaviour, SPICE's simulation capabilities turned out to be insufficient. So the 100 most interesting circuits were physically built and tested in the laboratory. To improve the quality of the signals generated during the tests, the researchers performed delicate tuning of the component parameters. Eventually, the number of interesting circuits was reduced to 49. The smallest chaotic oscillator consisted of one transistor, one capacitor, one resistor and two induction coils. Most of the circuits found showed non-trivial, chaotic behaviour with a sometimes astonishing scale of complexity. This complexity can be visualized using special graphs—attractors, geometrically reflecting the nature of changes in the circuit over time. Statistical analyses of the signals generated by the new oscillators did not, however, reveal any traces of two important features found in many self-organizing systems: criticality and multi-fractality. "We could talk about multi-fractality if different portions of the voltage variation diagram, magnified in different places in different ways, revealed changes similar to the original characteristics. In turn, we would be dealing with criticality if the circuit was in a state in which it could at any moment switch from regular to chaotic mode or vice versa. We did not notice these phenomena in the examined oscillators," explains Prof. Stanislaw Drozdz (IFJ PAN, Cracow University of Technology). "Critical systems generally have more opportunities for reacting to changes in their own environment. So it is no wonder that criticality is a phenomenon quite often encountered in nature. Evidence points to the fact that the human brain, for example, is a system operating in a critical condition." Of particular interest was one of the found oscillators, which generated voltage spikes resembling stimuli typical for neurons. The similarity of impulses was striking here, but not complete. "Our artificial neuron analogue proved to be much faster than its biological counterpart. Pulses were produced thousands of times more often. If it were not for the lack of criticality and multi-fractality, the speed of operation of this circuit would justify talking about an electronic super-neuron. Perhaps such a circuit exists, only we have not found it yet. At the moment, we have to be satisfied with our 'almost super-neuron,"" says Dr. Minati. The Cracow-based physicists have also demonstrated that as a result of combining the found circuits in pairs, behaviours of even greater complexity appear. Coupled circuits in some situations worked perfectly synchronously, like musicians playing in unison. In some, one of the circuits took over the role of leader and in still others, the mutual inter-dependence of the oscillators was so complicated that it was revealed only after careful analysis of statistics.